Eric Ewan was born in Wolverhampton in 1922, the youngest of the four children of Thomas and Jane Ewan. 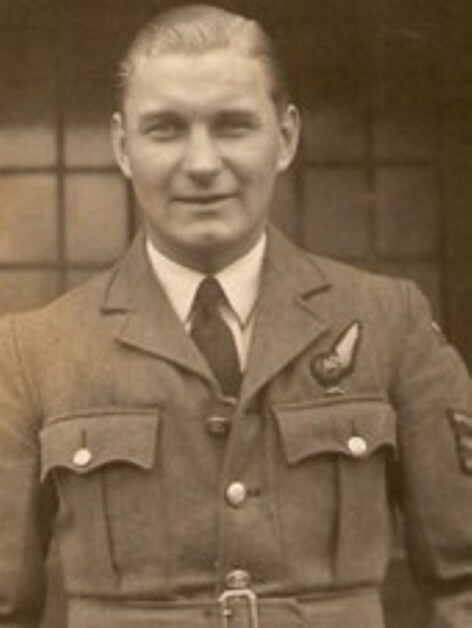 He joined the RAF shortly after his eighteenth birthday and was eventually selected for air gunnery training. In January 1943 he was posted to 1654 Conversion Unit, where the whole crew which would eventually fly on the Dams Raid with Cyril Anderson came together. The bodies of Gilbert Green and one other unidentified member of the crew were not found until after the others, and the pair were buried in Offenbach Cemetery on 28 September, two days after the other five. After the war all seven were exhumed and identified, and then reburied in Rheinberg War Cemetery. It consists of an Upkeep weapon outside the main door (a replica), and lots of models and photographs. Amusingly the operational part of the original Dambusters film is shown repeatedly . . . dubbed in German. The owner is struggling to keep the place going and would benefit from some support of any kind. Just thought I’d throw that in for interest. I visited this Museum in May , the gentleman who runs it is very enthusiastic and was very friendly. This man who’s name escapes me at the moment try’s very hard to keep it going .It is in fact a great addition to any visit to the Eder Dam , I do hope that his contribution to the memory of the Dams raid continues and I find it troubling that he may be struggling to keep it open. Nick Harris ,what do you suggest ? .